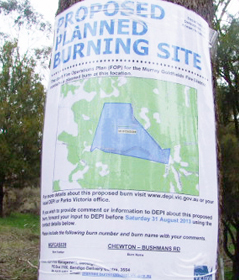 The Department of Environment and Primary Industry has included the 12 hectare parcel of public land “Chewton Bushmans Road MGF CAS028″, otherwise known as the Chewton Bushlands Reserve (starting at the corner of Commisioners Gully Road and Rankins Road) as one of it’s Proposed Planned Burning Sites for 2013/2014 (see map). While the formal submissions deadline of August 31 has passed it would still be worthwhile letting the Department know of any queries you have about the proposed burn. You can read some of the emails sent to DEPI here. You can read an email from the Friends of the Box Ironbark Forests (FOBIF) here outlining some background and including suggestions for composing emails. This entry was posted	on Monday, February 11th, 2013 at 4:11 am	and filed under Uncategorized. You can follow any responses to this entry through the RSS 2.0 feed.